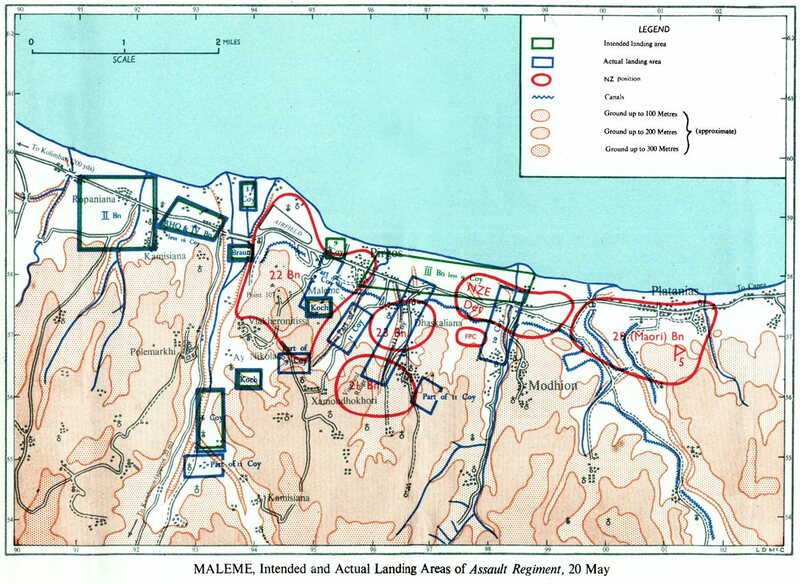 The next blog in our series ‘So you want to design a Wargame?’ focuses on building the map for our action around Maleme, Crete. 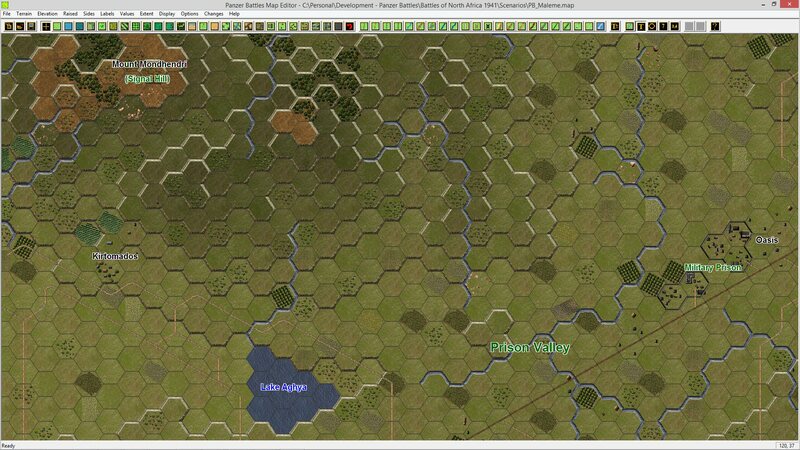 The first game in the Panzer Battles series (Kursk – The Southern Flank) used a custom program that expanded the previously published Panzer Campaigns map to the right scale and detail for Panzer Battles. Panzer Battles Normandy used a hybrid of this approach – a mix of auto generation and manual work. 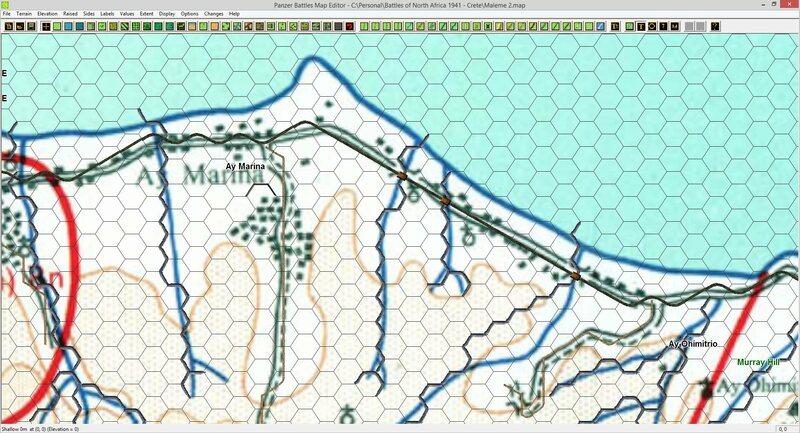 Post Normandy we have decided to hand make every map going forward – as the amount of detail having to be added after the fact, is easier to do during the initial map creation. 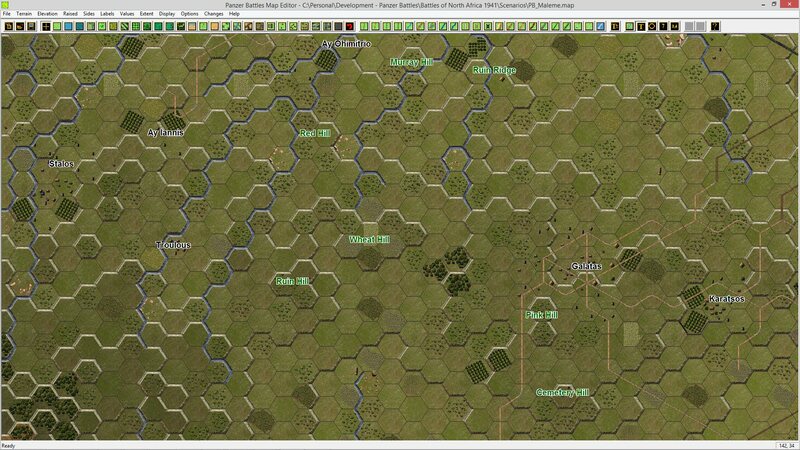 Building a map in Panzer Battles can be a very time consuming exercise – but also one of the most important components for any engagement. The lay of the land will more often than not determine the victor in any battle and ensuring the terrain represents the conditions the combatants actually fought in is an important consideration. Like all things in game design, it’s necessary to research the topic at a ratio of about 3x research to 1x doing. 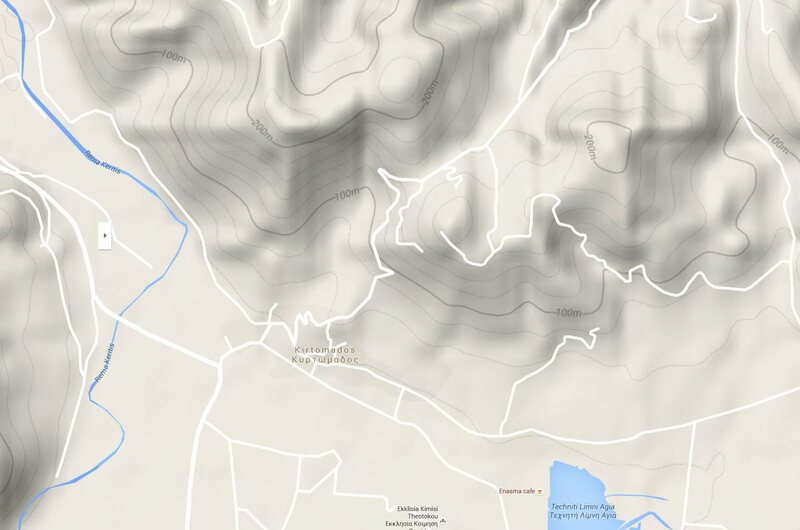 For map scale, it should ideally be 1:50,000 to 1:100,000. 1:50,000 equates to 500 metres for every centimetre on the map, 1:100,000 is one kilometre per centimetre. This scale usually provides details on building distribution, points of local interest and highpoints. For height contours, the optimal scale is 20 metres, with a maximum of 25 metres. Period features are important. 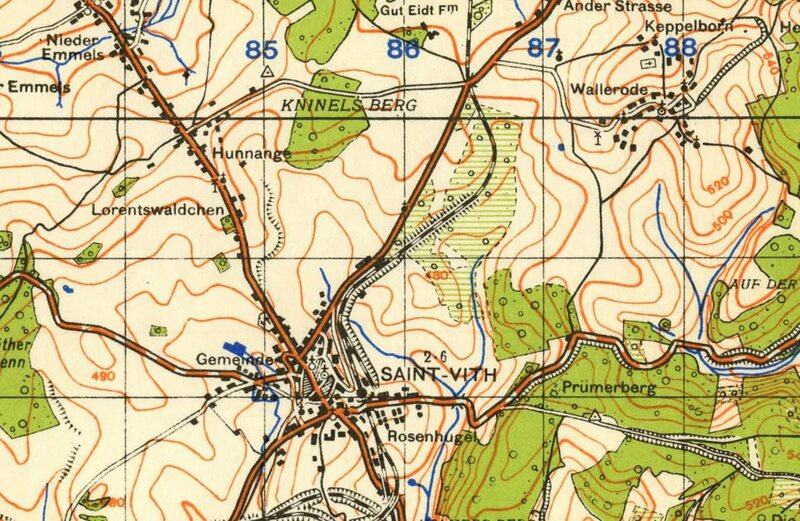 Many roads and towns have been built since 1945 and finding 1940’s era maps is key to reflecting the infrastructure as it existed during the war. The US Army map service (AMS) and Great Britain War Office, General Staff Geographical Section (GSGS) produced some great maps at various scales that satisfy these three requirements. 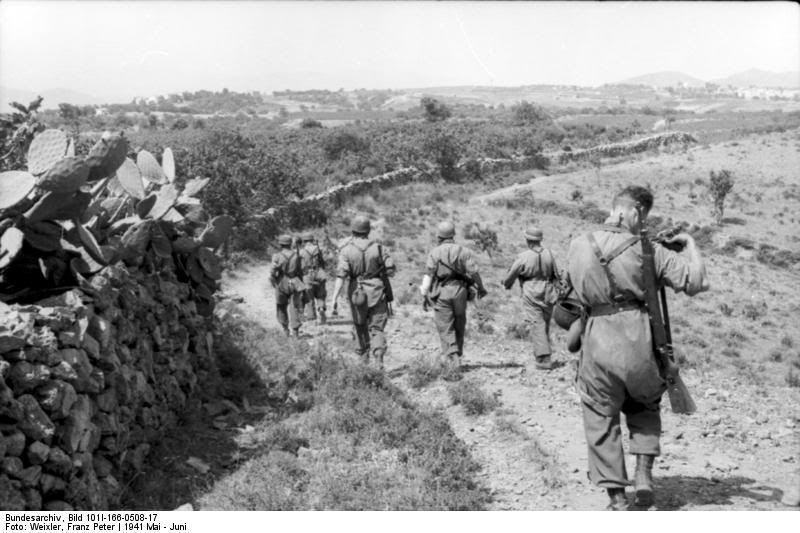 With knowledge of the kind of maps available, identifying what is required for Crete is relatively straight forward. The appropriate AMS maps are determined from the map index. 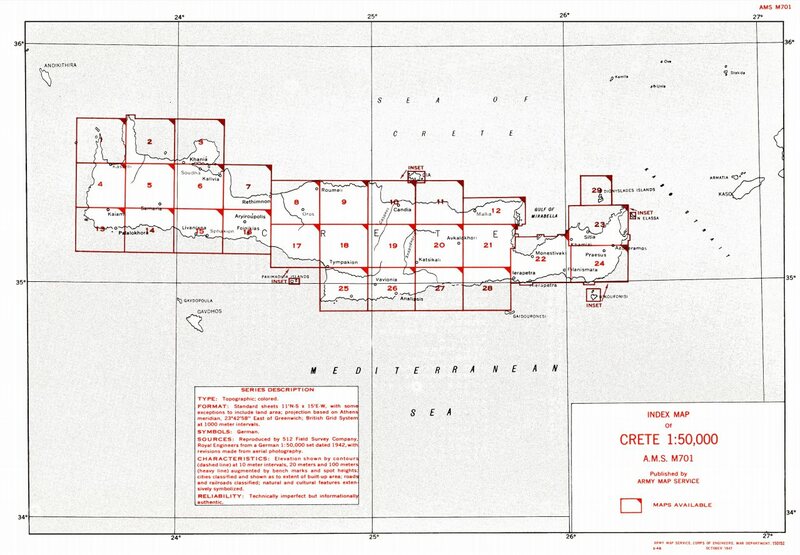 Crete is ‘M701’ and ideally map sections 2, 3, 5, & 6 are required. Unfortunately we run into our first significant issue. The appropriate 1:50,000 maps are not available for online access. There is not even confirmation that the maps are available physically. 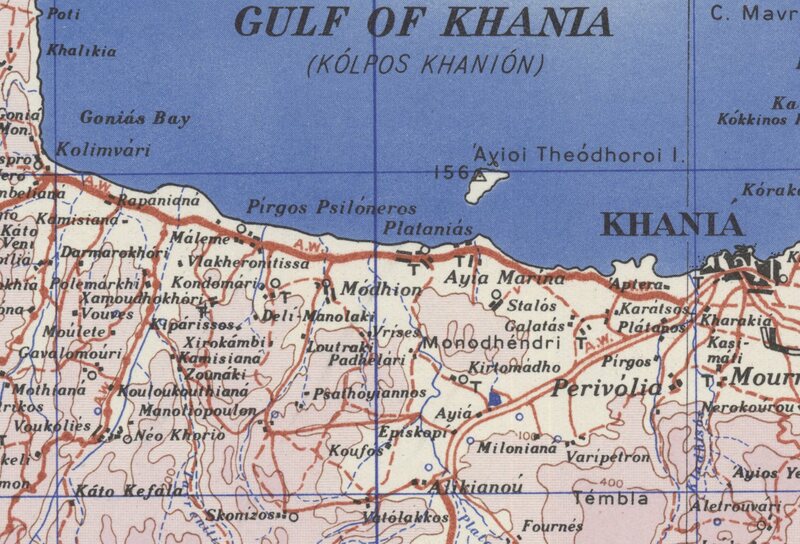 An additional search finds that a 1:250,000 map is available but the scale is too high to show the detail required in terrain such as Crete. This source map is detailed enough for us to create our Maleme map – the only issue is that none of the man-made details such as roads and towns can be used as they reflect the current infrastructure. It is sufficient though to create all the contour and coastline details. 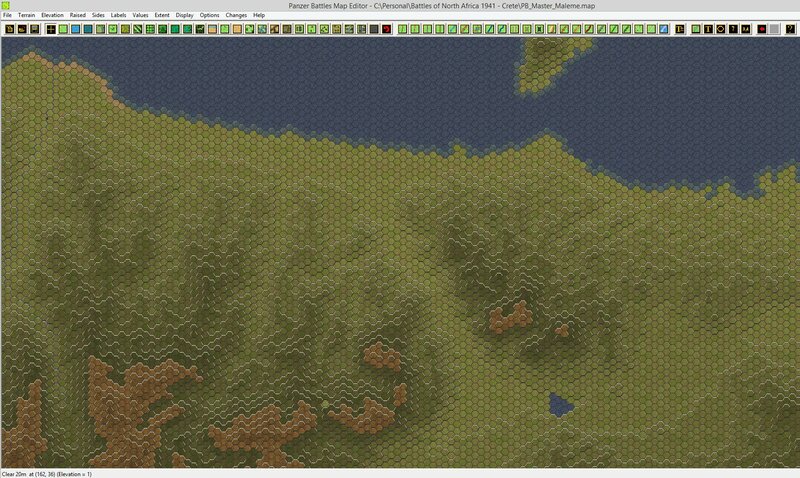 The next step is to resize the Google map to the right scale. There are a number of techniques for this, but essentially four hexes is equivalent to one kilometre. Once the scale is determined, the map is resized to the required dimensions. Here is the previous Google maps section within the map builder. 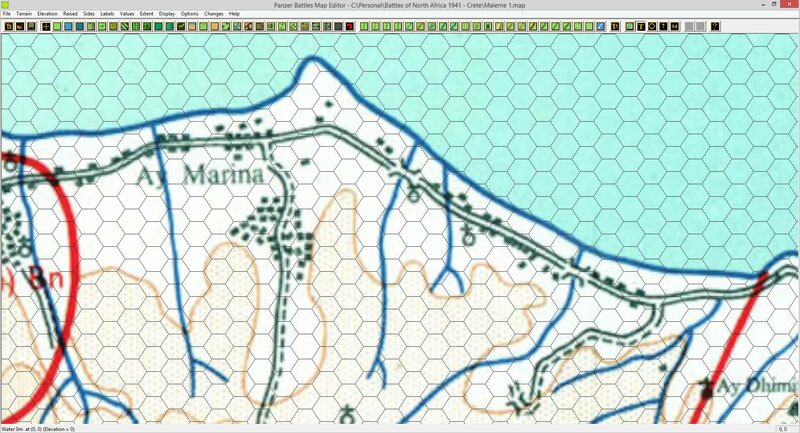 The map builder allows you to ‘overlay’ the resized map and then create the game map. This is a much quicker process than trying to do it by eye alone. As mentioned previously, we need to work out which roads and towns were present in 1941. Without period AMS/GSGS maps we have to look elsewhere to get these details. 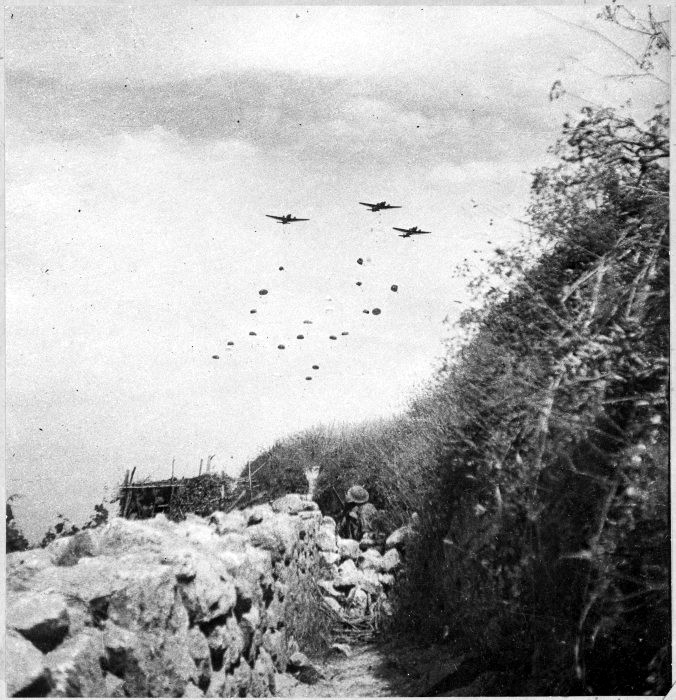 The German occupying forces mapped the island extensively in 1943, but we found we couldn’t get access to these. Fortunately Daniel Davin’s work ( http://nzetc.victoria.ac.nz/tm/scholarly/tei-WH2Cret.html ) came to our rescue again. The official New Zealand history had a number of sketch maps included that were sufficient to confirm the road network as well as the size of the various villages etc. Note the addition of beach, brush, orchards, fields and broken on the previous image. 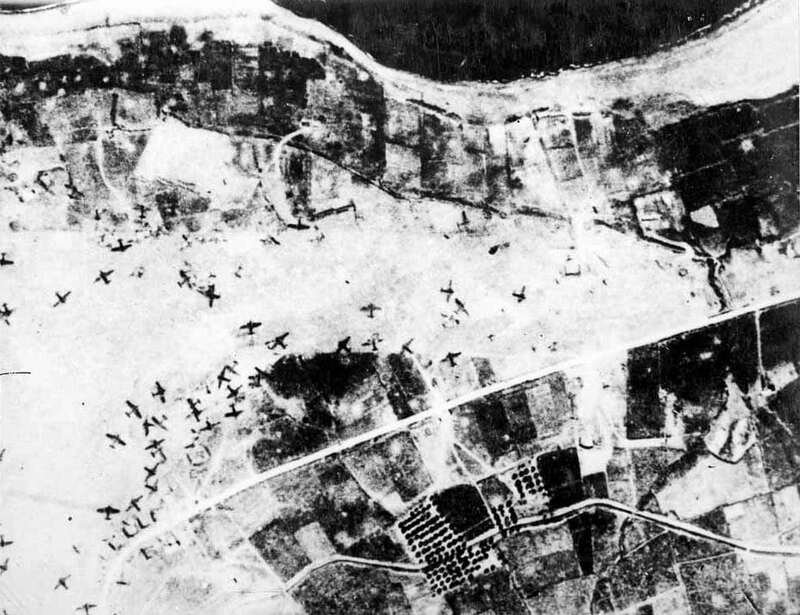 The beach detail was determined by looking at the satellite images from Google maps as well as the aerial photographs available from 1941. Most bridges were rated as only medium rather than high as none could carry any more than 7 tons at a time. Other features were described but not necessarily captured on maps. For example orchards (olive groves) and vineyards were setup near villages. Vineyards were almost always on slopes. 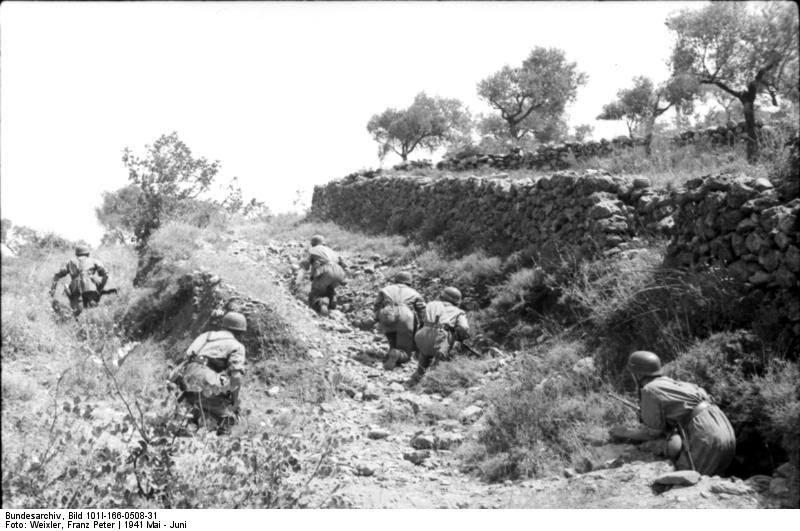 Brush represented low bushes that provided concealment but rarely blocked visibility like forest did. It’s also interesting to note how the mountains to the south really are a divider down the middle of Crete and that the bulk of habitation is in the north. 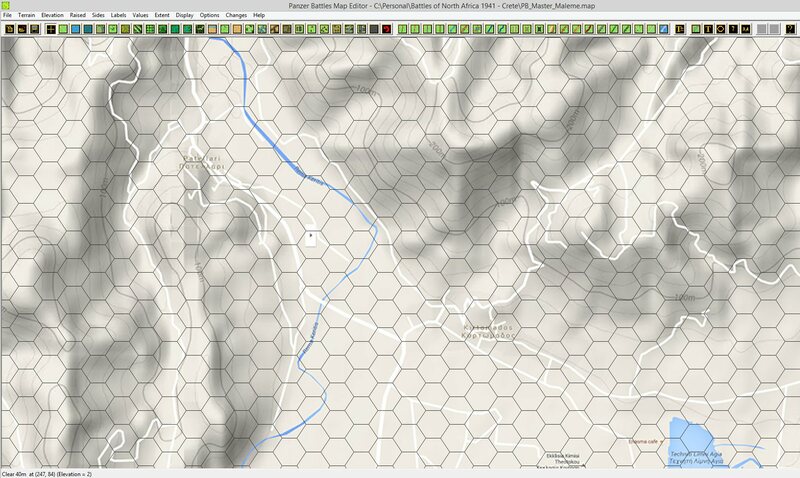 Finally, here are some selected shots of our completed maps (all can be clicked for full size). 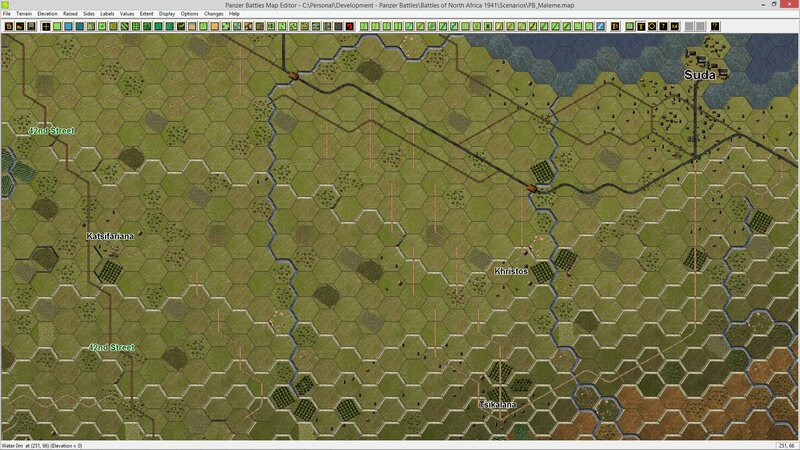 We believe it’s a reasonable approximation of the terrain and cover evident in 1941. We hope this (long) post gives you an idea of exactly how much work goes into a map. 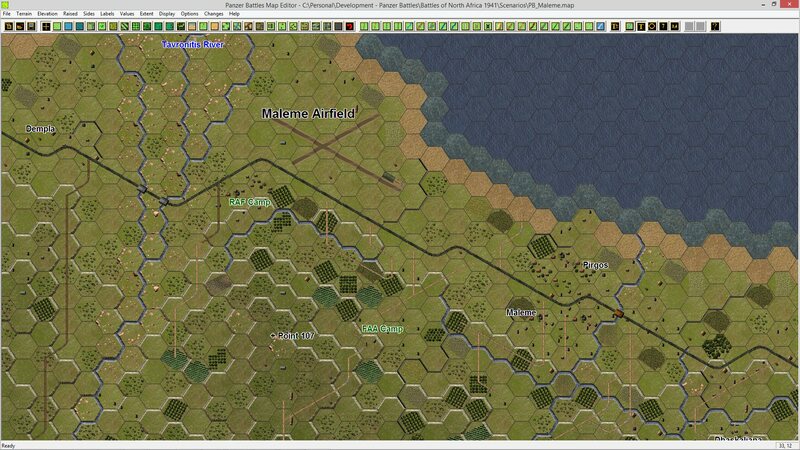 The final Maleme/Suda map tallied up to nearly 28,000 hexes – most of which will be used in various scenarios. Our next blog post will move onto in-game graphics and creation. Great post, David. Much appreciated. It must be satisfying work, putting the map together, if time consuming. It’s the artistic part of the process, after all. The maps above look fantastic. Is there no chance of making the rivers less hexy? 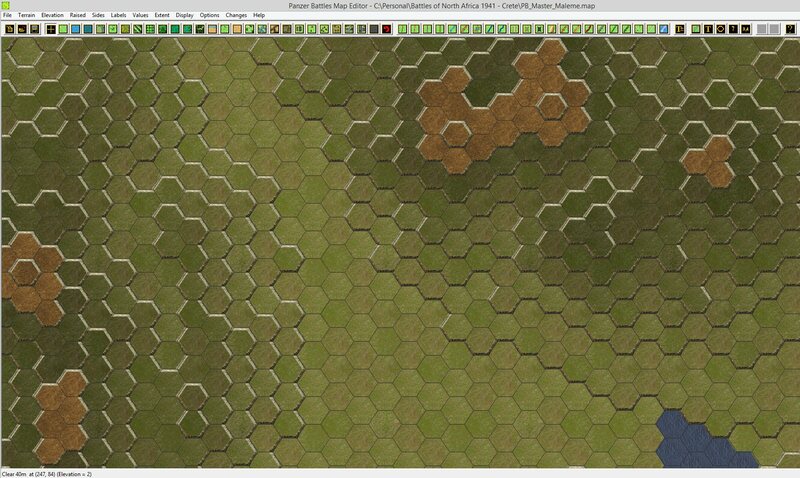 I think it’s fine for AT ditches and other manmade stuff to follow the hex edge, but can the rivers not be more rounded somehow, more natural-looking? I realise they are hex edge features, but it will tell us that clearly in the right-click side bar box, so do they need to be so angular? It’s a purely aesthetic point, but even a small amount of smoothing off of the pointy edges makes a big difference to how it looks. I mentioned all this in a comment for your last post, so sorry to raise it again. The whole process is satisfying. Every component works towards simulating the event and we have found over years of releasing ‘simulations’ that the more accurate each input, the more likely we are to get historical results and conundrums – without artificially changing anything. As far as rivers/streams – yes I heard you! I have been experimenting with various things including ‘cutting the corner. The results have been less than satisfactory to date, partly due to what happens when an angle is repeated but I have a few ideas to still try out. Hopefully we can improve the aesthetics. 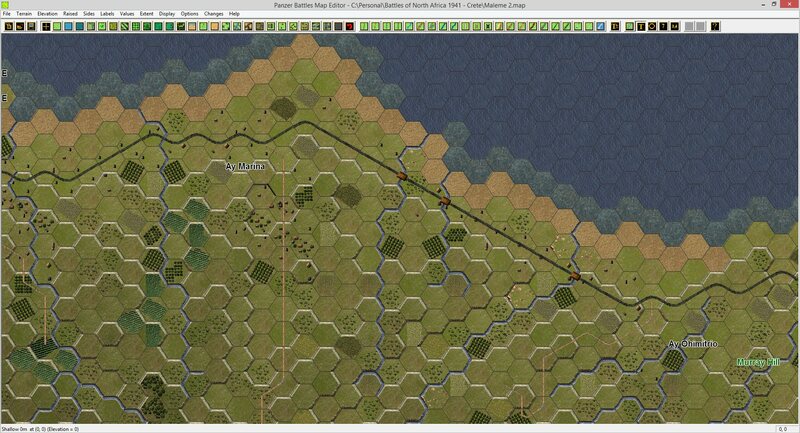 Yes we have started some of the North African maps. You can see an example under the PzB 3 tab. It’s all progressing nicely, but we’re not announcing all the contents yet! Thanks. I see the problem with streams, rivers etc, I think. Because they’re an edge graphic you can’t just draw them as you would a trail, for example, which I assume must exit the hex at the exact same points always (in order to connect to other tiles with trails). But a trail is a hex graphic, not an edge graphic. You can’t draw an edge graphic that ignores the corner but exits in the same places? I sympathise. I have tried modding these graphics for streams etc myself and wasted a lot of time not getting any useful results at all. 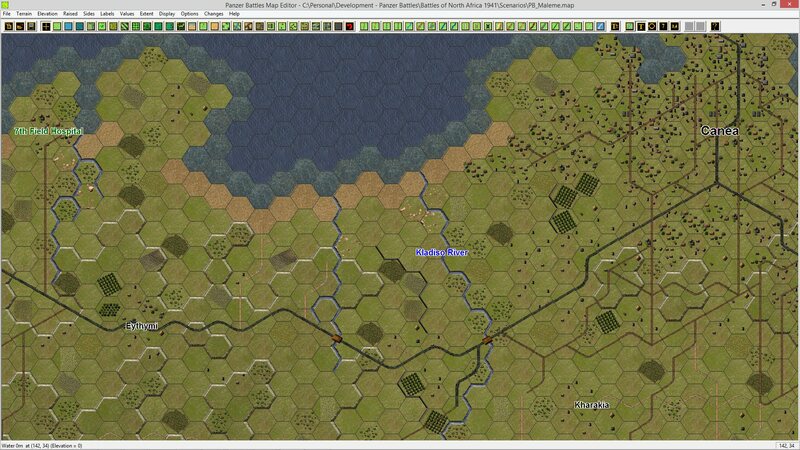 But there are hex based pics I could post showing ‘better’ streams, if I could post pics here, but I don’t think I can? In PC Tunisia43, for example, I have rivers that are less angular, only I can’t recall whether they’re original or I modded them that way. In CS:Middle east their hex edge features are sometimes (not always) more naturalistic. I can’t upload pics into these comments? Shall I post a pic into the blitz thread? Yes, posting at the Blitz is best. OK. Have posted a pic into the WDS thread there. Cheers. In the Canea pic above, David (showing the town) are the graphics small or large version? The size of the buildings etc, I mean. They look larger than I recall the small version being and smaller than the large version. You have been studying the images! They are the ‘small’ graphics that were released with Normandy. One difference may be town vs village. Town generally has larger structures. Please note all graphics are work in process and as I’m a terrible tinkerer potentially not indicative of the final version that we release. The map is so complete and nice. I only miss a different scale of colors for altitudes. ie light green /yellow/orange/light brown/brown, etc. Without drastic color changes I think it would be more intuitive. Thanks for your comment Javi. That´s true, it looks the darker is the green the higher is the altitude. Using this fix rule (the darker the higher) always in all maps will make altitudes easier to read, despite the colors you choose eventually. Furthermore your hex contourns are extremely intuitive and playing with hex outlines disabled helps a lot to perceive heights. I´m really excited with your progress. You guys are doing something great!